Ashley Ezell was born with Stargardt Macular Degeneration, she was diagnosed at the age of 12. Soon after, she was declared to be legally blind. Despite her failing vision, Ezell was determined to achieve her goal of becoming a teacher. Five years ago she joined the teaching staff at St. Francis Xavier School in North Central Phoenix. For the last two years, she has taught the fourth grade. In order to navigate around the classroom, she has memorized the layout of the school and her classroom. As for her students, she gets to know their voices, their shapes, and even the way they move. 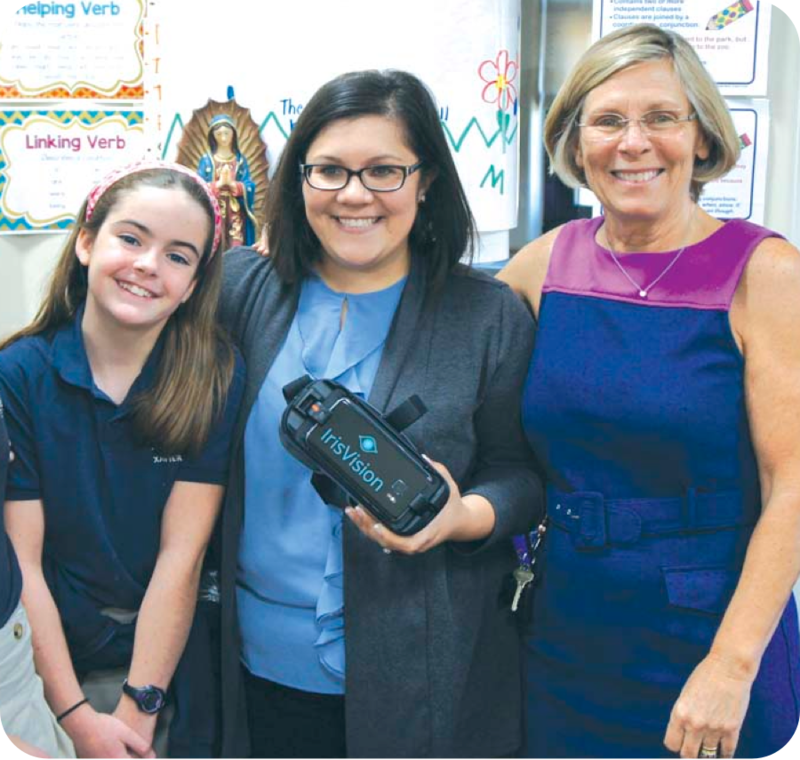 A fellow fourth-grade teacher introduced Ashley to IrisVision. “When I put them on, I was able to clearly see somebody standing in the courtyard from the upper balcony”, Ashley recalls. Normally, Ashley’s vision is 2200/40, with the headset her vision is 20/30. “I don’t think I ever saw that well, even as a child,” Ashley says. When standing in front of the large dry-erase white board, she would often have to be pressed up against it, facing forward, to read what is written on it. “I was blocking the students’ view and moving all around to read it. Now I can stand in the back of the room and still see the board,” Ezell explains. The community wanted to get involved to help pay for Ashley’s IrisVsion device, specifically the school’s girl scout troop who donated money from their cookie sales. Her students were excited to help their teacher. When they saw Ashley wearing the unit, they thought it “looked really cool.” But they were astonished to discover how well she could see with them on. Her students say they think it has been a life-changer for her, it really helps her be a great teacher.